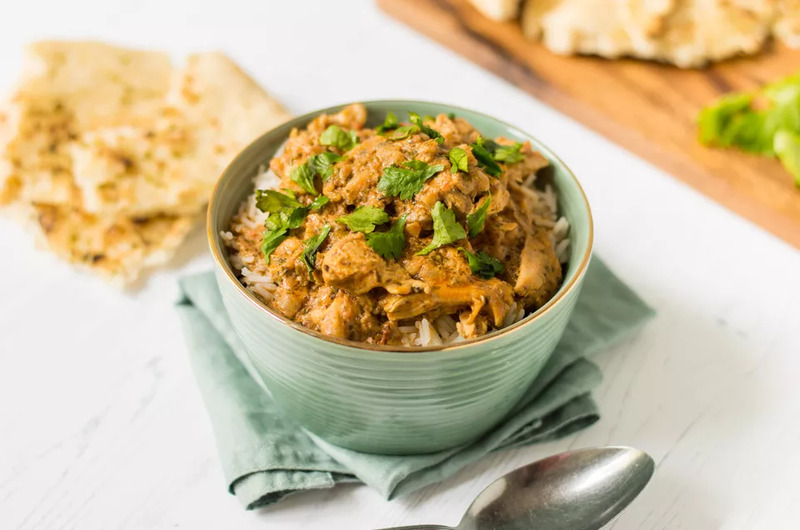 Indian Butter Chicken (Murgh Makhani) features tender spiced chicken that’s marinated in yogurt and grilled, and then served in an aromatic spiced tomato-based sauce that’s velvety smooth and rich with cream and butter. Start by mixing all the ingredients under marinade and adding the chicken to it. Mix well, cover and set aside for 15-20 minutes while you make the gravy. For the gravy, heat 1 tablespoon oil and 3 tablespoons butter to a large kadhai or dutch oven. Add cinnamon, cardamom, cloves, whole red chilies and garlic. Saute for a minute or so till fragrant. Add onions and saute on high heat for 2-3 minutes till pink and translucent. Add tomatoes and cashew nuts. Mix once, reduce the flame to a simmer and cover and cook for 15 minutes till the tomatoes start breaking down and becoming slightly pulpy. Switch off the flame. Fish out the cinnamon pieces and using an immersion blender, puree the gravy till smooth. If you don’t have an immersion blender, transfer the gravy to a liquidiser and blend. The trick to blending hot foods is to cover the lid with a thick towel and pulsing instead of blending at one go. This ensures that the lid doesn’t explode. Check out this tutorial for more deets! In another pan, heat a tablespoon of oil. Add the chicken pieces and sear them on both sides for 2-3 minutes on high heat. Switch the flame back on under the puree. Add the chicken pieces, chilli powder, ketchup, salt and 1/2 cup water. Bring this to a boil. Reduce the flame to low, and cover and cook for 20-25 minutes. Once the chicken is cooked, stir in the dry kasuri methi and fresh cream. Serve hot with butter naan and rice.